Gene says "This is the Best Version of this Book so far!" This highly acclaimed, award-winning book has become a "must read" for anyone looking to become a healer and also for those who would like to explore their own spirituality more fully. This expanded and enhanced edition made specifically for the iPad, reveals simple yet powerful discoveries that can unlock your miraculous potential to eliminate fear, dispel anger and mend the broken heart of just about anyone. It contains over 100 spectacular photos, 5 audio guided visualizations plus 3 instructional videos. Easy enough for a beginner to understand yet significant enough to impress nearly any master healer! is built into all living things. 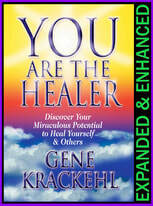 A must-read for anyone doing any form of healing!